Last weekend, I made yet another trip to the East Midlands to rejoin my wife at our new home in Loughborough. My mum and dad came down with us as well to see the new house. We had a great weekend, despite the miserable weather - rain, rain and more rain! How very British! Anyway, the rain did finally stop just before Sunday lunchtime, allowing us to go for a drive round the local area. During the drive we stopped in an interesting area of the Charnwood Forest in Leicestershire, which turns out to be a particularly significant area of Britain in geological terms! I had heard that Charnwood contains some of the oldest rocks in Britain, but knew little more than that. On our short walk (it had to be short to avoid potential hypothermia in several of our inappropriately dressed party! ), we did see some interesting exposures of what seemed to be granite, but I didn't think that these were the rumoured 'oldest rocks in Britain'. As you'll be beginning to realise by now, I'm not the sort of person who is going to leave it at that! No Sir-eee! A little delving within the 'wibbly-wobbly web' was required to enlighten this curious wannabee geologist! Here's what I've found in an article by Mike Lewis, extracted from his book 'The Rocks of Charnwood Forest'. Click here. Pre-cambrian rock exposure at Bradgate Park, Leicestershire. 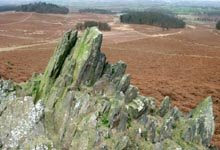 There are indeed rocks of pre-cambrian age in the Charnwood Forest area and they are volcanic in origin. Back in the early Palaeozoic, this area formed part of the southern fringe of a continent of which Scandinavia and northern Scotland also formed a part. Volcanic eruptions occurred over a prolonged period from a major crater that is now located near to High Sharpley. Other smaller vents surrounding the main volcano also contributed. Material ejected from the volcano was deposited around the crater for several kilometres with a high proportion carried in the wind in a southerly direction. There was a great amount of variation in the size of volcanic material produced, which lead to the formation of the agglomerates, tuffs and ashes evident in the exposures seen at Beacon Hill. (See map). As the period of vulcanism subsided, grading and sedimentation occurred on the sides of the volcano, leading to large areas of conglomerates, overlain by volcanic mudstones. This series of rocks is called 'The Brand Series' and are particularly evident in the western parts of the region as outcrops such as the 'Hanging Stones' beneath Beacon Hill, Billa Barra and Groby. After the period of volcanic activity, the mid Palaeozoic period saw uplift and folding and the creation of a huge anticline. The numerous faults that were thus created allowed igneous intrusions to form through them which are now seen as the syenite outcrops at Groby, the 'Altar Stones' at Markfield and Cliffe Hill. Apparently, the dome at Charnwood would have been several thousand feet higher than it now is while its base would have been over a thousand feet lower than its present elevation due to the continuous erosion, stripping rocks from the exposed surfaces, filling the surrounding valleys with the eroded material. Following this we entered the carboniferous period with the surrounding valleys being swamps and shallow marine environments. The Triassic period saw Charnwood buried beneath dry desert clay-sands ultimately forming marls. The impermeable nature of marls thus allowed shallow lakes to form. The Cenozoic saw further erosion in the tropical environment and the following glacial periods of the Pleistocene added its own process of 'freeze-thaw' erosion and examples of Charnwood rocks have been found in places some considerable distance from the area due to glacial transportation. So there you go! An rather brief geological history of Charnwood! That's what I have deduced from a bit of reading and may be somewhat abbreviated and maybe even wrong!?! If there is a 'proper geologist looking in who has spotted any alarming errors, please feel free to correct me! As I have said before in a previous blog, we learn just as much by being told we've got it wrong, as we do when we are being patted on the back! What I need to do now of course, is get out there, see all these outcrops for myself and take some photos! When I do I'll update this blog and post them up! There has also been an interesting development within the younger members of the family recently! My 16 year old daughter Anna, while revising for her GCSE Geography exam, has been bombarding me with questions about geology and rocks recently and has developed a particular fondness for saying 'slatey cleavage' as often as possible! AND even Aimee who is 11, has been asking me what a glacier is and how it forms! So perhaps they are both gradually beginning to realise that maybe geology AND their step-father aren't quite as boring as they once thought? There's nothing quite like getting outside and 'into the geology' to make it all come alive! One final thing to note is that the pre-cambrian rocks of Charnwood include within them, fossils of some of the earliest examples of multi-cellular life forms on earth! More on this next time! Time to read some books! What a strange feeling it is! With the Open University course now all wrapped up, I'm left with a slightly empty feeling! No assignment to aim for? No deadline to meet? Weird!?! Having got over that realisation now, I find I am able to go ahead and read a book without having to necessarily write a 500 word appraisal of it, (mind you, the type of books I read, I tend to do that in my head anyway!) So at least now I am able to get stuck into my two 'birthday books'. My mum and dad gave me some money for my birthday, so I purchased 2 geology books would you believe? 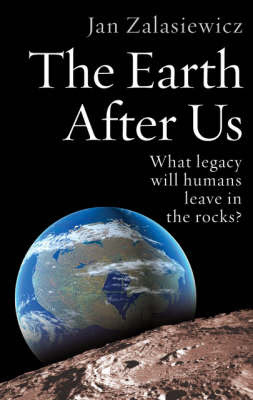 Firstly, I got a book called "The Earth After Us", by Jan Zalasiewicz. In this book, the author imagines what a population of alien visitors to Earth would make of our planet when they arrive 100 million years from now, long after the human being has gone the same way as the Dodo. What have we humans left behind in the fossil record? What will these aliens make of the 'human stratum' and how will they judge us? I've just started this one and it's a fascinating read as I've often wondered myself, what evidence of our lives will be left millons of years from now? What will the remains of say, a landfill site look like millions of years from now? Bottles, both glass and plastic, mountains of diposable nappies, all compressed and changed into another form presumably, but what? I'll read on and see what unfolds! Incidentally, by pure coincidence, Jan Zalasiewicz just happens to be a lecturer in Geology at Leicester University and I met him and had a brief chat while at an open day at the Uni last July! When I spotted the book in Waterstones a while ago, I recognised the name from somewhere, but couldn't place it. A quick look at the sleeve notes and the penny dropped! The second book is one I've been itching to buy ever since I heard about it's imminent publication. Following my family's trip to Arizona last year, I've been fascinated not only by the Canyon, but the whole of the Colorado Plateau area. While there, I bought a book by Wayne Ranney (I may have mentioned it before within this blog? Maybe a million times?) called 'Carving Grand Canyon', which is a superb book, detailing the theories and mysteries surrounding the possible formation of Grand Canyon. 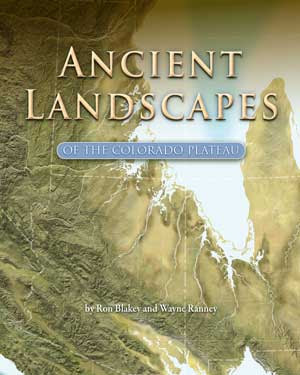 Well, the multitude of staggering geological wonders to be found in the American southwest are inextricably linked to the ever changing Colorado Plateau and this is the subject of Wayne Ranney's latest book "Ancient Landscapes of the Colorado Plateau". Written in collaboration with his onetime Northern Arizona University lecturer Ron Blakey, this publication is a truly stunning book! I only picked it up from the postal depot this morning, but a brief flick through it's pages reveal Ron's palaeogeographical maps in all their glory. Let's not beat around the bush - Ron's ground breaking maps are a work of utter genius (see the slideshow of his world maps at the lower right column of this blog!) and their publication is long overdue! Together with loads of explanatory diagrams and Wayne's text, it looks an absolute gem of a book! I'll let you know more and maybe do my own little reviews of these books at a later date.